PUT YOUR TRUST IN THE LEADING YACHT BROKERAGE HOUSE IN TEXAS! WE ARE LOCALLY OWNED AND OPERATED BY THE SAME OWNER FOR GOING ON TWO DECADES! WE HAVE A DEEP PASSION FOR WHAT WE DO AND ARE COMMITTED TO CUSTOMER SATISFACTION. THIS IS WHY OVER 50% OF OUR BUSINESS COMES FROM REPEAT AND REFERAL CUSTOMERS. DON'T LET THE NAME FOOL YOU! WHILE WE ORIGINALLY SPECIALIZED IN PRE-OWNED SPORTFISHING BOATS, WE HAVE SINCE BECOME A LEADER IN PRE-OWNED CRUISERS, MOTOR YACHTS AND TRAWLERS SALES. 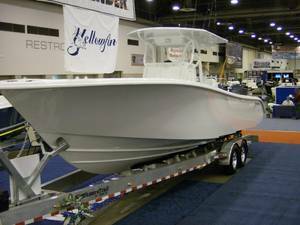 OUR NEW BOAT INVENTORY INCLUDES HIGH QUALITY CAROLINA CLASSIC INBOARD EXPRESS FISHERMEN, AS WELL AS YELLOWFIN AND TideWater CENTER CONSOLES. LOCATION! LOCATION! LOCATION! WE HAVE THE BEST LOCATIONS FOR YOUR BOAT OR YACHT TO BE SEEN! THERE IS NO SUBSTITUE FOR EXPERIENCE OR LOCATION AND WE HAVE THEM BOAT! OUR BROKERAGE SALES DOCK AND OFFICE ARE LOCATED ON BEAUTIFUL CLEAR LAKE IN SOUTH SHORE HARBOUR MARINA IN LEAGUE CITY, TEXAS. 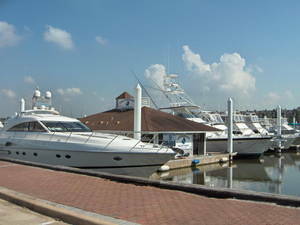 "SOUTH SHORE HARBOUR MARINA" IS THE PREMIER MARINA IN THE HOUSTON AREA AND WE ARE LOCATED ON PIER 15. OUR LARGE FLOATING OFFICE AND DISPLAY DOCK ARE THE FIRST THINGS YOU SEE WHEN ENTERING THE MARINA. CLEAR LAKE IS JUST MINUTES SOUTH OF HOUSTON, TEXAS AND HAS DIRECT ACCESS TO GALVESTON BAY AND THE GULF OF MEXICO. OUR NEW AND USED BROAKERAGE TRAILERABLE BOAT SALES OFFICE IS LOCATED IN LEAGUE CITY, TEXAS ON MARINA BAY DRIVE/FM2094 AND IS JUST TWO MINUTES FROM OUR SOUTH SHORE HARBOUR OFFICE AND THE NEAREST BOAT RAMP. WE RECENTLY EXPANDED OUR SALES DOCK SPACE AND TRAILERABLE BOAT LOCATIONS. NO MORE WAITING! WE NOW HAVE 25% MORE WET SLIPS AND NEARLY AN ACRE OF LAND FOR OUR TRAILERABLE BOAT DISPLAY. WE ARE ACCEPTING QUALITY LISTINGS AND CURRENTLY HAVE WET SLIPS & LAND SPACE AVAILABLE. Why purchase or list your existing powerboat or yacht with us? Two high traffic locations to better serve you. Comprehensive advertising, which includes two multiple listing websites (YACHTWORLD & BUC), as well other Internet sites and major boating publications. Experienced sales staff with excellent product knowledge. Whether your interest is purchasing or selling your 20' bay boat or your 86' sportfisherman or motor yacht, our experienced sales staff can assist you in your needs. Please call, email or come by and visit us and you will immediately see the Texas Sportfishing Yacht Sales difference. IF YOU ARE UNABLE TO FIND THE BOAT THAT FITS YOUR NEEDS HERE ON OUR WEBSITE, LET US FIND IT FOR YOU! OUR INVENTORY CHANGES ALMOST DAILY. WE ARE BOAT BROKERS NOT BOAT SALESMEN, AS WE WORK TO FIND THE BEST BOAT FOR YOU, NOT JUST SHOW YOU WHAT IS ON OR DOCK. JUST CALL OR EMAIL AND WE WILL PROMPTLY ASSIST YOU. 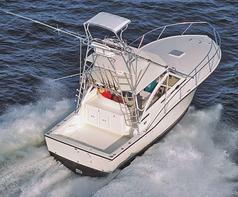 This has to be one of the nicest 45' Cabo on today's market! Her gelcoat is in absolutely in amazing condition as she shines like new (pictures don't do her justice) and is free of gel coat crazing, which is typical of most Cabos built in this era! She is captain maintained and the interior, the aluminum marlin tower, as well as the engine room are all in amazing condition as well! "ASPIRATION" is powered by reliable twin 800hp MANS, with only 3000 original reported hours and the 3000 hour service was completed at approximately 2900 hours. She is the single stateroom model that features a very spacious salon area with a large u-shaped settee that converts to sleep (2) and has an abundance of storage underneath. The interior also has the optional teak and holly flooring throughout. She is loaded with equipment, such a climate controlled helm deck, Cockpit Rocket Launcher, Nautical Designs Fighting Chair (not show in pictures), plus much, much more! There are also many updates and she is rigged for serious fishing! Priced right and bring all offers!